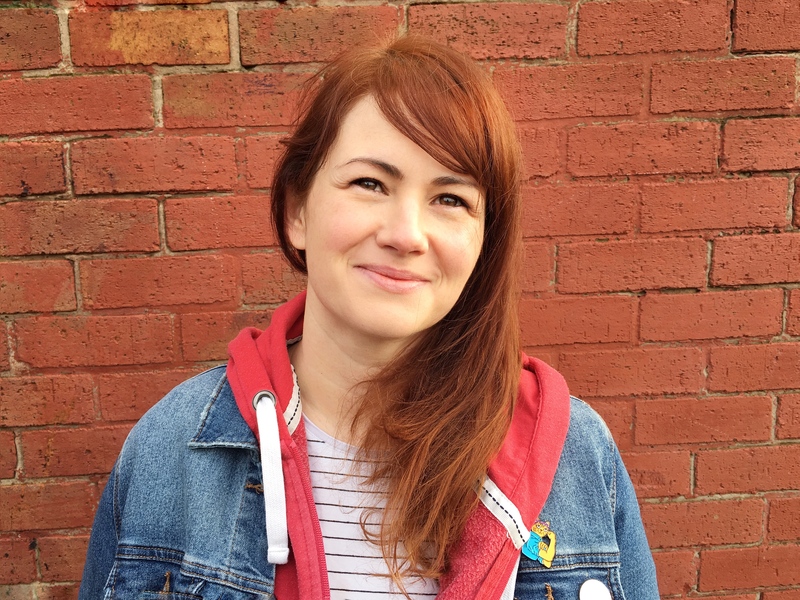 It seems like a lifetime ago now, so much has happened since Christmas day but still we had such a lovely day that I couldn’t pass up the chance to write a little bit about it. This Christmas we had never expected to be at home as a family, our twin boys were due to be delivered on Christmas Eve but plans changed (more on that another time) and we were able to spend Christmas Day at home as a family of three one last time. I had everything ready and luckily Father Christmas was able to make his delivery on schedule. 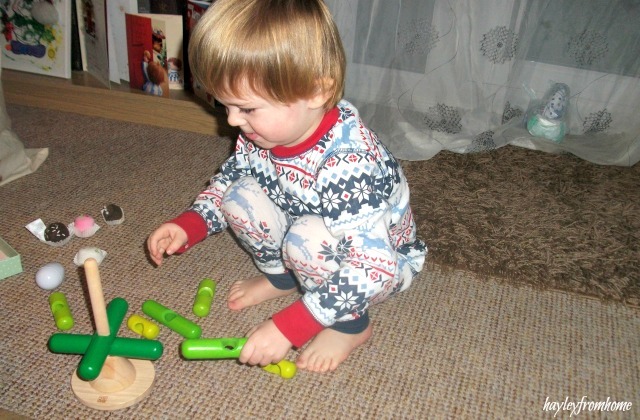 This year I intended to take full advantage of Lucas not yet being old enough to pester for toys and I got a range of slow toys; toys that are good value for money, built to last and are educational or encouraging imaginative play. Now we have three boys I’ve found it more important than ever to buy things that will stand the test of time! On Christmas morning we all get up together, make a cup of tea then start to open gifts while still in our Christmas pyjamas. 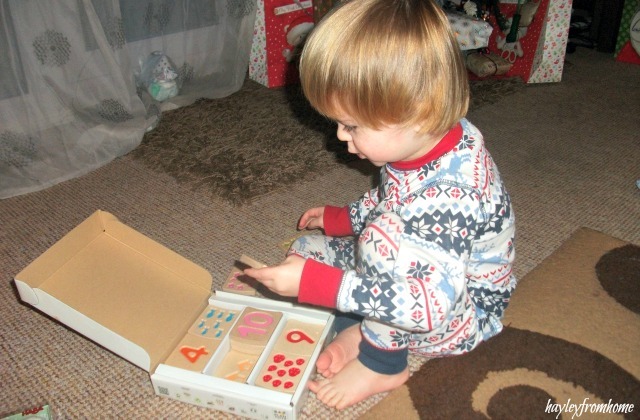 Lucas loves to play with everything he opens so we never rush; he exclaims ‘wow’ at everything he comes across and dances on his toes with excitement. 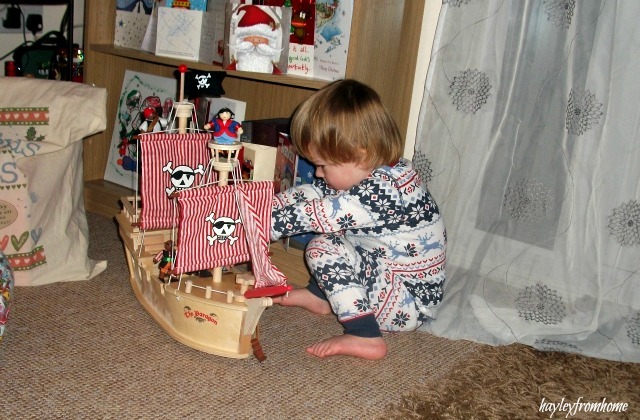 My favourite by far this year was his wooden pirate ship, I think we were more excited about it than he was! 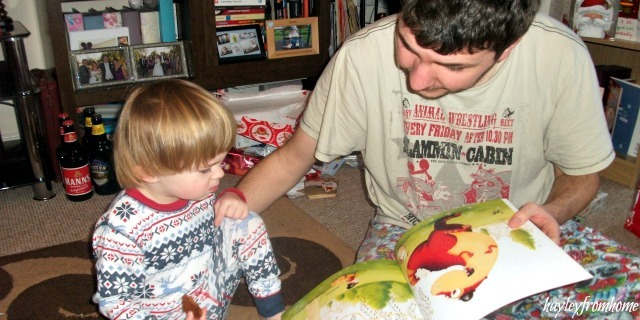 His stocking fillers were some lovely wooden number tiles, wooden stacking toys, some cute play food for the kitchen he got last year and of course books, there will always be books! We had made no plans for the day but luckily we were able to be accommodated for a delicious Christmas dinner at my in-laws then onto my mums for supper with her and my brother. All in all a pretty perfect Christmas, despite not being the one we expected! The pirate ship looks so cool! It is so much fun to play with, my favourite toy for Lucas!